Myzdamena's World: Celebrate good times c'mon! Anyone else got that song in their head now too? Fabulous stuff, loving the doilies! Oh how pretty Gail! Love the soft colours and how ell you matched to that sweet image. Thank you for sharing with us at The Craft Garden this month, good luck! What an adorable card, Myz! Thank you so much for celebrating the 200th challenge with us! Looking forward to seeing you & the Little Myz in future challenges! Such a great card with that cute image. Love the striped background, which matches perfectly with the colours on the image. Thanks for playing along on the 200th Challenge at Meljen's. Good luck. Lynn, Guest Designer, Meljen's Designsand good luck. Cute card! Thank you for joining us at the Cards Galore Encore Challenge #3 -Using stamp or Digi Stamp Anywhere! Cute card ! Thanks for playing with us at the Craft Garden ! 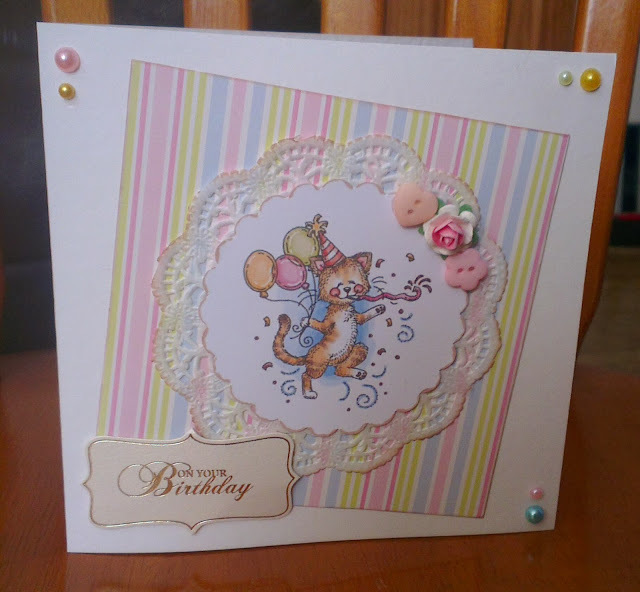 Myzdamena, Such a sweet card, love the direct to paper around the edges of the paper doily. Thank you for joining us for the pastel challenge at The Craft Garden this month. We allow more than one entry though the month and look forward to having you play with us again. PS. Saw your message about having trouble with Google Connect. I can still access mine but I like Bloglovin' more because they send daily emails with updates to the blogs I follow which makes it easier to keep up. So pretty and elegant! Thanks so much for playing with us at The Craft Garden!